Payal Jain Indian Couture Designer and Pratham UK recently linked up to host an event attended by the enchanting Jacqueline Fernandez. 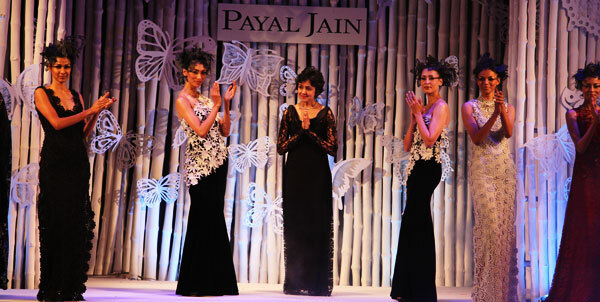 The Event took place on Wednesday 28th April and showcased the collection by the designer, entitled: ‘Butterflies in My Heart’ and Pratham UK was the choice of Payal Jain’s as her charity to promote. The charity helps young children in India with literacy and skills and helps to provide education to those struggling in their hopes and right to an education. Butterflies in My Heart went down a treat at the Piccadilly Hotel Le Meridian as models adorned in beautiful dresses floated about like butterflies! “No child should be deprived to the basic right of education as I honestly believe it is a pre-requisite to get anywhere in life. I am so happy to be a part of a charity that is so hands-on and is making this happen for the large proportion of the under-privileged in our country”. The event raised a significant amount of £42,000 for Pratham UK which is a branch of Pratham India and the UK charity will be pleased with the excited reception by the guests, whom numbered above 300. The funds will be sent to help children in India with obtaining an education and helping them with learning and development. You can find out more about Pratham UK at pratham.org.uk and certainly keep an eye out for the prized London collection of Payal Jain whose collections can be found at payaljain.com. « Chris Gayle breezes to a 100 in 30 balls!